DYNAMIC FORCES® - AMAZING SPIDER-MAN #800 ULTRA-RARE 1:500 VIRGIN VARIANT BY ALEX ROSS! 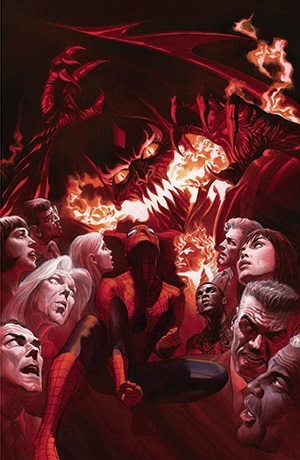 AMAZING SPIDER-MAN #800 ULTRA-RARE 1:500 VIRGIN VARIANT BY ALEX ROSS! Dan Slott and Stuart Immomen are joined by many of the artists who made the last 10 years of Spider-Man so Amazing! The biggest Peter Parker/Norman Osborn story of all time unfolds over one 80-page story, a scope unmatched in comics! Who lives? Who dies? And what scars will Spider-Man bear from here on out? FINAL COVER MAY VARY. AMAZING SPIDER-MAN #1 COMIC SKETCH ART EXCLUSIVE SEPIA VARIANT COVER BY ADAM HUGHES! AMAZING SPIDER-MAN #800 VARIANT COVER BY HUMBERTO RAMOS!